An 18-hole golf course and a large resort-hotel are no longer planned for Chambers Bay in University Place. Instead, Pierce County officials have asked the California developer behind the project for a smaller development. “We didn’t feel from a county perspective that it was realistic to have a development predicated on the building of a new golf course,” deputy county executive Kevin Phelps said last week. The county’s request came after the U.S. Open in June. The space the USGA tournament took up outside the county-owned Chambers Bay golf course made county officials realize a second golf course didn’t make sense, Phelps said. Last year, Los Angeles developer Bob Sonnenblick proposed a $150 million resort-style golf course and hotel on the southern portion of the 930-acre Chambers Creek property. The course was planned for directly south of the Chambers Bay golf course with Chambers Creek Regional Park as a buffer. The hotel was proposed off Grandview Drive, near the entrance to the park. “We feel that even though we could technically squeeze another 18 holes in, it might make it so we’re not competitive for a future (golf) event,” Phelps said. 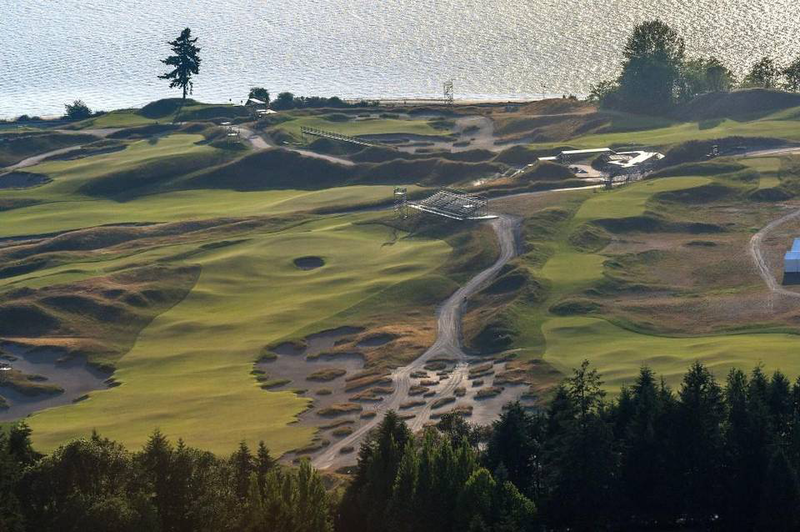 County leaders want to host future golf tournaments, including another U.S. Open at Chambers Bay. Sonnenblick, who owns Sonnenblick Development, is working on a new proposal. “We understand the county’s reason for this decision, and we have no problem with it,” Sonnenblick wrote in an email to The News Tribune last week. Losing the golf course means a smaller hotel, he said. “Clearly without the second ‘resort’ (golf) course we would no longer be able to justify building a large, 300-plus room resort hotel in one big phase,” Sonnenblick wrote. Previously a dramatic, five-story hotel with sweeping views of Chambers Bay golf course and Puget Sound was planned. Plans included a 258-room hotel, conference center, 180-seat cafe and restaurant, and a swimming pool. The conference center was proposed for what now is the county’s environmental services building, with a ballroom added on. Sonnenblick expects to have new project renderings to the County Council soon. “We are very excited about how the new, smaller, hotel layout sits (on) the land parcel and how well it works with the site’s current long-term master plan,” he said. The county’s decision to request a scaled-back development was “partially economic and partially making sure that we have the ability to use that property for a variety of uses,” Phelps said. After seeing architectural drawings for the hotel a year ago, at least two County Council members cited concern with impeding the public’s ability to access the site. Public amenities include trails, parks and playground as well as the golf course. Sonnenblick maintains he will develop a project that promotes pedestrian accessibility to the site.